1.) Atherolichenous Plaque (*11a start, then 9+) Begin in a challenging offwidth slot (crux) that used to be overgrown with lichen using a #4 Bro or # 2 Dude. Then move upwards into an entertaining handcrack and roof. Turn the cool roof using a medium large cam (about a #3 Camalot) and continue to the top. 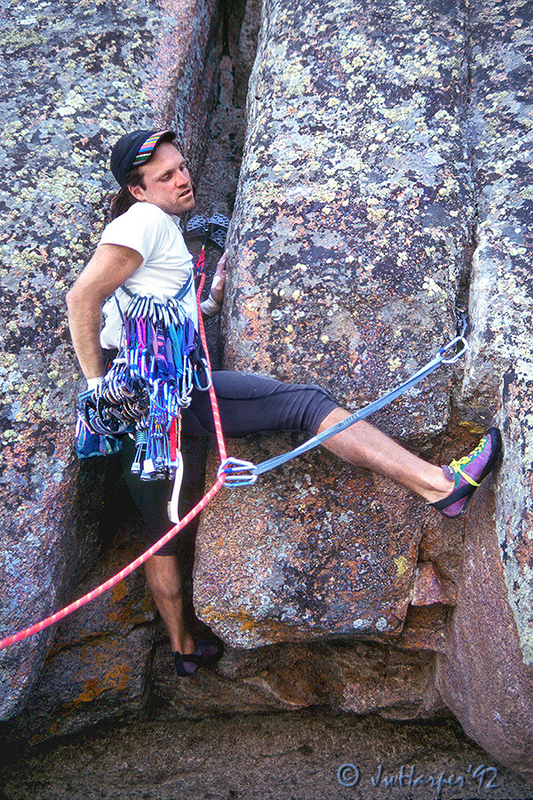 Belay on gear. The shot below right shows Tim Hume geared up and beginning the horrific slot start. Note the ‘Big Dude’ up in there! (Harper and Thomas, ’92). *NOTE: mislabeled in the ’04 Kelman guide, also in Orenczak, 2011. 2.) 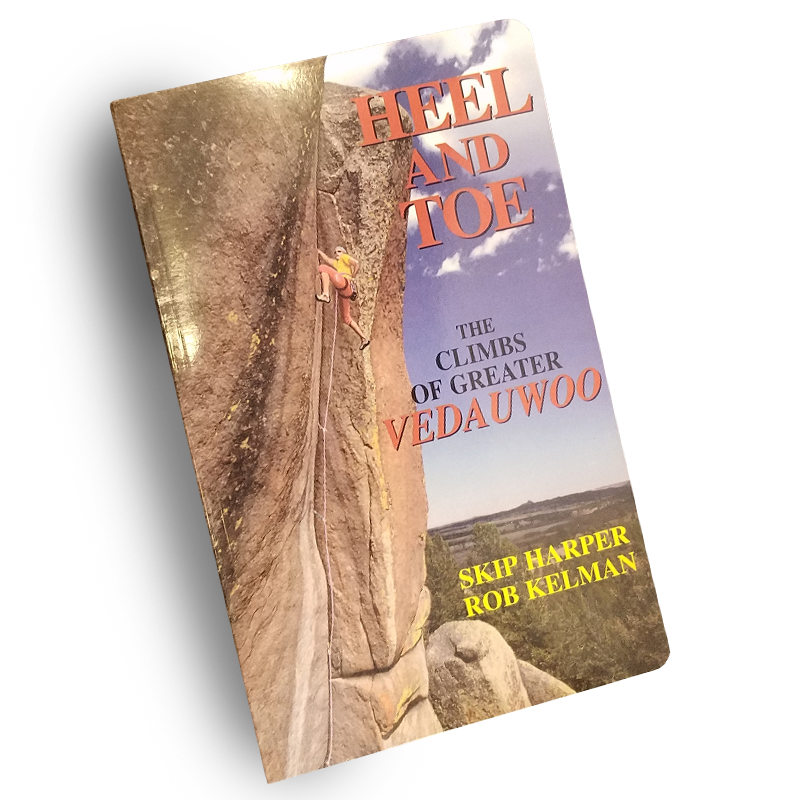 The Devil in Disguise 11a Ascends the crack system 15 feet right of #1. 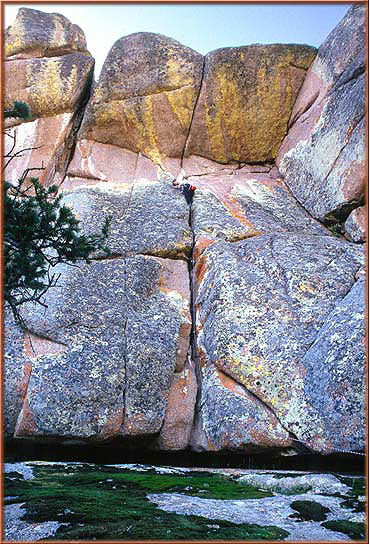 The start is thin and balsy on popcorn granite. Then ascend a respectable handcrack to an obvious roof with a hellish looking maw above. Set some pro, turn sideways and become a self-destructive contortionist for another 30 feet using good and not so good edges. Caution, there are teeth in here that bite!! 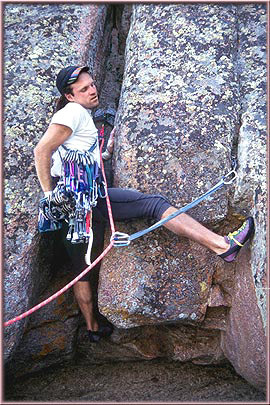 Belay above on gear. (Harper and Thomas, ’93). *NOTE: overlooked in Kelman, ’04 and Orenczak, ’11. DESCENTS: Either 1.) walk off to the right (west) and down the “Hypertension” side, or 2.) use the rap rings near the eastern top of the formation (see the phototopo below). LOOK!! 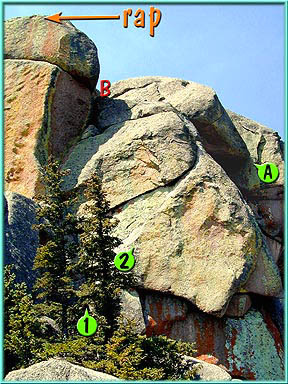 Two more routes are found around the corner/ left/east of route # 1 shown above. NORTH FACING! Never sees the sun. 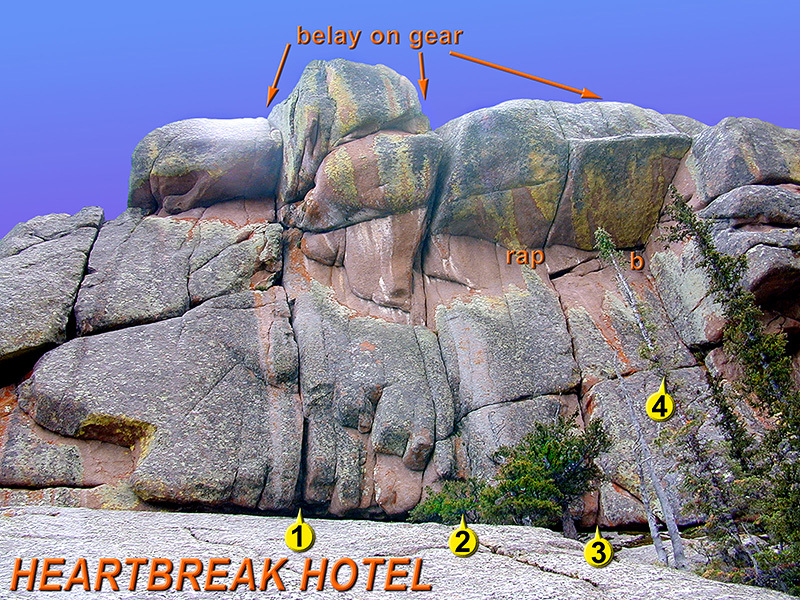 Great for escaping mid-summer heat on 4 quality routes. 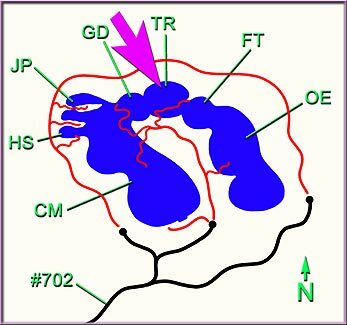 Directly ‘in back’ (north) of HYPERTENSION. including Kelman,’04 and Orenczak, ’03, ’11. There is a 2 Fixe ring rap station on the top as indicated. Rumors have it there is an old dude with dark hair and sideburns, long duck tails and wearing shades seen frequently bivying around here. He’s usually strummin’ a box and singin’ tunes. Just pass him by, he’s mellow and harmless.